Basements are often the site of the most severe flood damage. If your basement is flooded, call us immediately and we will pump and extract the water to get the situation under control. We remove and replace all affected flooring, walls, and other water damaged construction in your basement. We are experts in flood extraction and water damage restoration, with over 25 years of experience. Once the flood damage has been mitigated, it is important to remediate any mold growth. We completely dry your basement, then inspect and remove all signs of black mold. We also apply anti-microbial spray on exposed beams to prevent future mold growth. 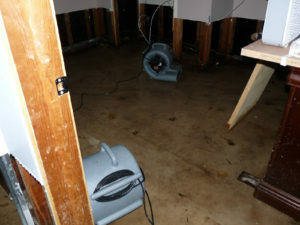 We then restore your basement, waterproof it, and install proper drainage and pumps to prevent future floods. Recurring problems such as ground water seepage and flash floods require special precautions and construction to protect your basement from more flooding. To shield your home or business from flooding and water damage, we waterproof and create proper drainage. Sump pumps are necessary to remove rain or ground water that enters and drains through the perimeter drains of a waterproofed basement. We are proud of our expertise in protecting homes and businesses from basement flooding. Less specialized or experienced contractors do not know how to correctly and effectively protect basements from flooding. It is important to understand where the water comes from and how to protect your property. Water pressure from ground water forces moisture through foundation walls and through openings in the footing of your home. This pressure causes flooding and major structural damage to basements and foundations. The flooding and water damage is likely to cause mold, rotting, and other moisture related problems. We provide complete waterproofing and drainage construction to prevent floods from occurring in your basement. We install sump pumps to remove water from your basement sump basin and discharge it into a municipal storm drain or dry well. Whether you have a flooded basement or want to prevent future floods, call us at (877) 645-1428.